"Do What Makes Your Heart Smile". 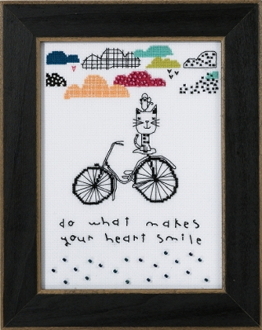 An adorable design with a cat sitting on a bicycle. Stitch on the enclosed aida fabric. Design size: 5.25" x 7" (13.3cm x 17.8 cm). Mill Hill Glass Beads, 18 count Aida Fabric, floss, needles and chart with instructions. Frame sold separately, see item 40-303 Matte Black frame (GBFRM19).